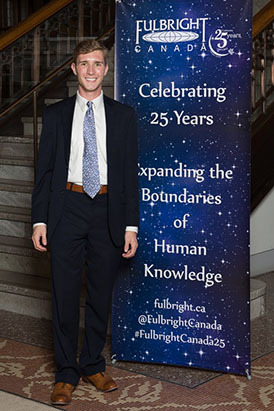 From the January 2016 Desktop News | Fulbright Canada has awarded Jordan Sandy, a senior majoring in English and economics, a Killam Fellowship to study at the University of British Columbia during the 2015–2016 academic year. The Killam Fellowships Program is a competitive program providing an opportunity for exceptional undergraduate students from universities in Canada and the United States to spend a semester or year as an exchange student in their neighboring country. The program provides a cash award of $5,000 a semester, a three-day orientation in Ottawa, and a three-day spring seminar in Washington, D.C.
Sandy, a Chicago native, is a University Fellow and has held membership in the Lambda Sigma Academic Honor Society. He has interned with Creative Campus and worked with SaveFirst, a free tax preparation service for low-income families. Sandy plans to pursue a career in brand and route development within the commercial aviation industry. He has been an airport ambassador for Midway International Airport in Chicago and a network-schedule planning intern at Delta Air Lines in Atlanta. While in Canada, Sandy hopes to learn more about commercial aviation through the University of British Columbia’s Center for Transportation Studies and Vancouver International Airport. This Killam Fellowships Program, administered by Fulbright Canada, is supported by International Trade Canada, the American Killam Trusts, and the U.S. Department of Foreign Affairs. It is part of Fulbright’s strategy to foster mutual understanding between Canada and the United States. Fulbright Canada is sponsored by the U.S. Department of State and the Canadian Department of Foreign Affairs, Trade, and Development. It is treaty-based, nongovernmental, and charged with identifying and supporting the best and brightest in Canada and the United States.